Let’s start at the beginning, I guess that starts with the rocks and geology. I’m not a geologist but I like to build up a picture of our county in a full way and that starts with what has been under our feet for millions of years, the geology of our earth. And where do we begin? Our oldest rocks are volcanic eruptions stretching back into our past of perhaps up to 1,000 million years ago and these would have been part of what we call the Pre-Cambrian era. You will find our oldest rocks out on the coastline at Treginnis. There is also a stretch of Pre-Cambrian intrusive rocks along the ridge from Roch to Treffgarne. You may ask what are intrusive rocks, well essentially they are igneous rocks which are basic earth materials of volcanic origin from the earth’s interior. Those igneous rocks which solidify below the surface of the earth are called intrusive as opposed to those that solidify at the surface which are called volcanic or extrusive. 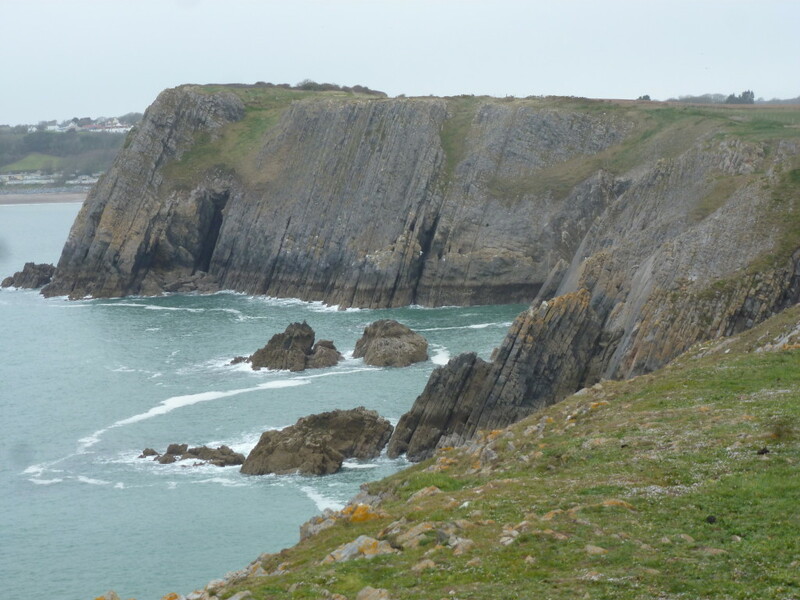 So far we have deduced that our oldest rocks lie in the North of Pembrokeshire so that leads us onto constructing a geological divide between the North and the South of Pembrokeshire. Yes, we’ve heard of this divide before but in a different context; an historical and cultural divide the Landsker Line. Now this takes us further to something very interesting, this cultural divide between the historical Norman/English of the South and the Welshry of the North almost magically matches the geological separation under our feet. The older rocks of the north and the older established Welsh people of the north, stand up against the newcomers of the south, the rocks and the people. Now we are beginning to rock!!! In the North the geology is part of the Caledonian orogeny and these rocks are all older than 395 million years ago. The mountain building movement comes from the north, from Caledonia or Scotland and is generally aligned from the East North East to the West South West. Take a look at the map above and you will see the the rocks line up in the north on a diagonal starting in the Cardigan Teifi estuary area toward the St Davids and St Brides area. 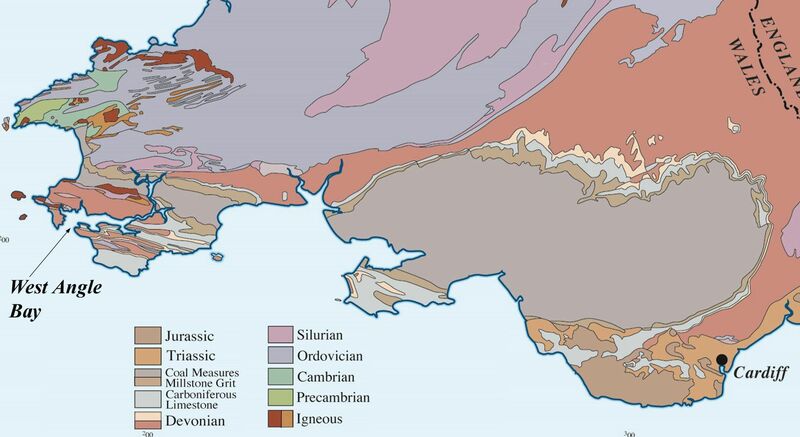 We have already shared about the oldest igneous rocks of the North in the St Davids area of the Pre-Cambrian era, so the the next phase in the shaping of our landscape was the Cambrian era, which takes up to around 500 million years ago. Again most of this geological strata can be found in the St Davids area to affirm the fact that the oldest rocks in Pembrokeshire are found around St Davids. The Ordovician era is the next stage along our time- line of geology and as you can see from the map the bulk of the landscape of the North is taken up with this period. 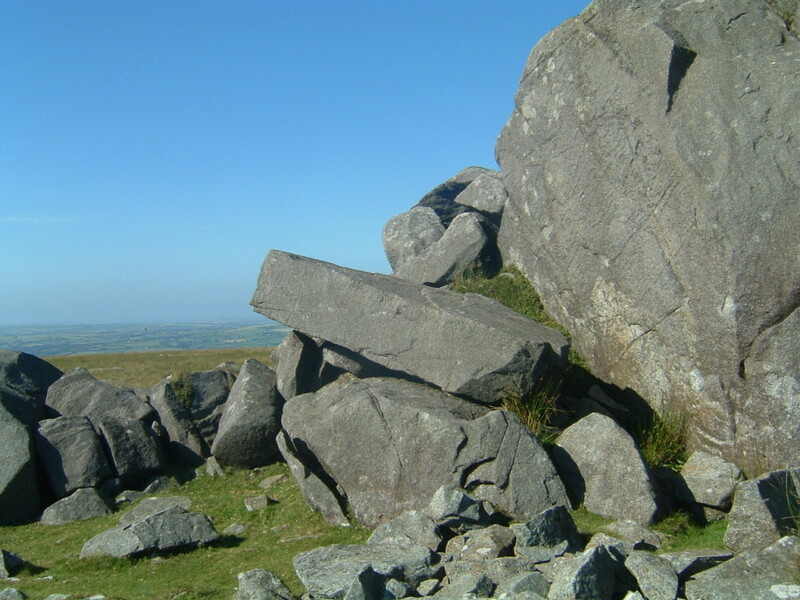 These rocks would include the mudstones and shales of the upper reaches of the Western and Eastern Cleddau rivers and the Preseli Hills, including the dolerite rocks of Carn Meini and their links with Stonehenge. As you can see the geology of the South is much simpler. They form part of the Amorican orogeny and originated from the south and as you can see from the map move in a different diagonal line to the north. The alignment is of east south east toward west north west, again check the map above and you will see the diagonal stretch running from Tenby to Marloes. As a rule all of the rocks are between 295 million and 395 million years ago, with an exception of some particularly older igneous rocks in the Talbenny to Benton area and Johnston, which are of Pre Cambrian and Cambrian. So the the geology of the south can be summarised by 4 diagonal belts stretching from the south coast in a west north west direction to the west coast. The millstone grit, limestone, coal measures and red sandstone which we will hear more of in future posts and particularly how the geology has been of considerable benefit to the development of human activity and survival. Well this has been quite an informative post and I am most grateful for the work already completed many years ago by Dr Brian John and his book The Geology of Pembrokeshire. Brian’s geological summary has certainly helped me clarify my own understanding of our geology and if you find some error or serious omission in my own summary, please get in touch.